A personal exploration of Disney media along with the chronicling of my many trips to Disneyland through the years. 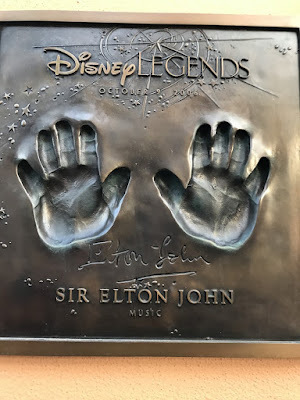 And while this is primarily a Disney and Disneyland blog, along the way I occasionally contribute writings on some other pop culture and media topics just for the fun of it. There are almost 800 posts to this blog. Click through the Archives and I hope you have a good time. 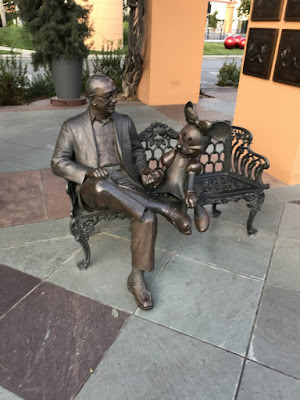 Enjoy The Disneyland Traveler Blog (completely without ads or annoying attempts to sell you anything). 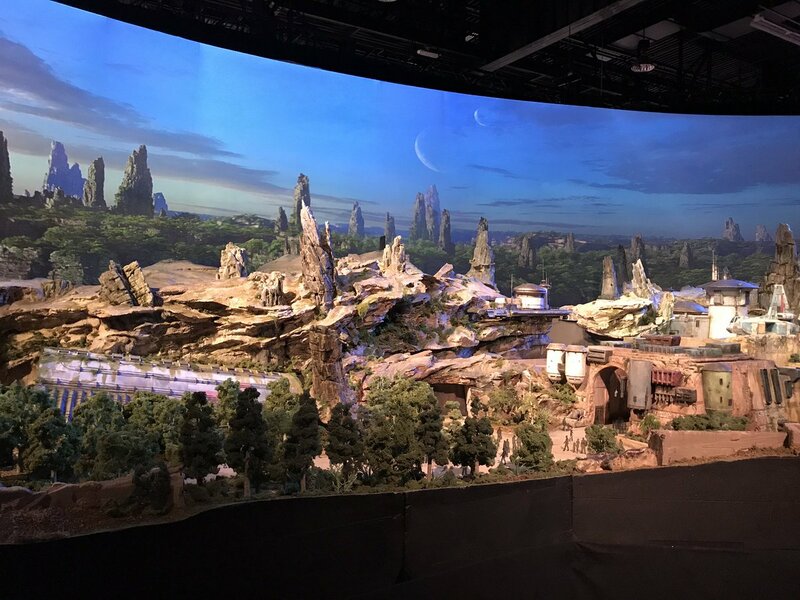 So announced today at the D23 Convention this weekend was the official name of what was referred to, for years now, Star Wars Land is the official name of Star Wars Galaxy's Edge. Personally not impressed with the name. 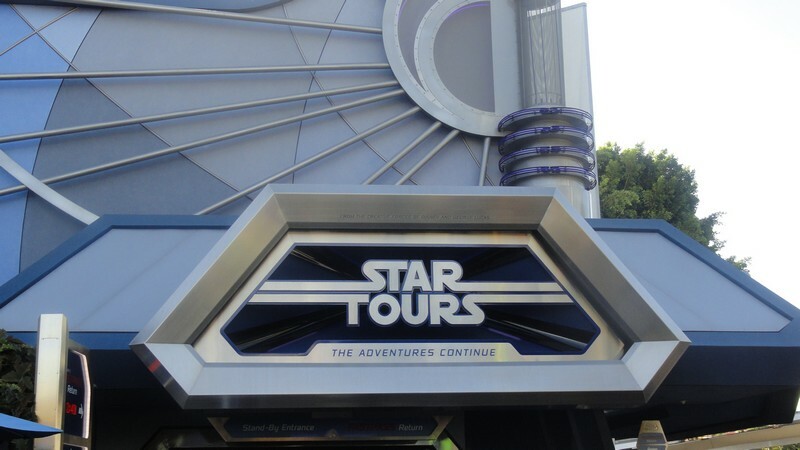 It has been called Star Wars Land for so long now that the name will probably stick. 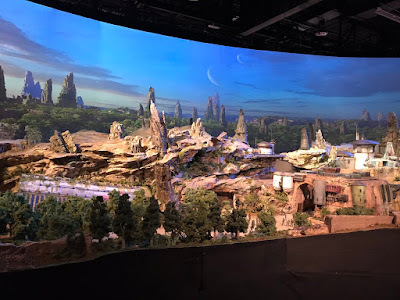 I can't see a 10 year old telling his parents "I'm going to Star Wars Galaxy's Edge". Most likely it will just be cut short and referred to Star Wars. Just call it what it is. Well a week from tomorrow, the Disneyland Traveler will be making that 450 mile trek down to our favorite theme park - Disneyland. The first 325 miles or so is I-5 nothingness mostly comprised of farmland and pastures broken up by pockets of gas stations and food places. Boring. Then you hit the grapevine and up the mountains that head into the land of white knuckle driving. Everybody drives in L.A. I can't think of anyone who remotely touches a freeway can enjoy it. It can be down right scary! It should take us about 6 or 6 and half hours to make it to our hotel. Check in time is 3:00 pm. So what is the routine once we arrive? Drop of the bags and beat it over to the parks? No, as I've gotten older I've learned to pace myself. Get the bags into the room. Do some unpacking and preparation for the week and then sit down and rest a bit. There will be plenty of times for the parks. They're not going anywhere and I have a whole week ahead of me. The past couple of trips, we have found a nice place to eat dinner (Bubba Gump's over at the Garden Walk has been a popular favorite lately) then head back to the room for some relaxation and an early bedtime because come Monday morning, we are off to the races. Mrs. DisneylandTraveler won't be coming with me on this trip. I will have my sister with me and we will be meeting up with a couple of wings of a family tribe during the week. Mrs DLT went with her son to Disneyland while I stayed home to stay with our dogs a few months back. This is a little payback. It's gotten quite expensive to board our dogs and bringing them over to someone's house for them to take care of the animals is asking a lot. I know people who will do it but would not want to make it a habitual practice. Did I mention we also have a cat? Hopefully, Mrs DLT and I will call on that favor as we get closer to the holidays. Time goes by fast. There still is a lot to do. I use to say if you used the expression "let's go on a trip to Disneyland" my response would be "give me an hour and I'll be ready". I'm not that naive anymore. It takes more than an hour as you get the right clothes washed and packed. I need to prepare whatever cameras I plan to take. Need to go to the store to bring some drinks and snacks for the room. I also pack up a power strip and extension cord just in case. So that 's what I will be doing throughout this week and as I plan, organize, and try not to forget anything. 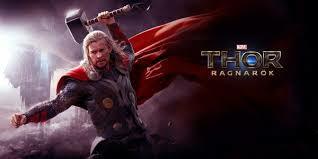 I'll be ready. That's for sure. Trader Sam's is a fun oasis within the confines of the Disneyland Hotel. Well, stripping away most of the elaborate theming of the place, it's a tiki bar. They serve up some mighty exotic drinks (often served in tropical souvenir mugs you can buy and take home - I have 3) and they also offer a fine selection of appetizers - my favorites are the chicken lettuce wraps and the fried long beans. Even Mrs DisneylandTraveler, who does not drink at all, loves the place. When certain drinks are ordered the place erupts with volcano rumblings, bells clanging, and pictures moving on the wall. Although inside Trader Sam's is not all that big, there is a lot of room for outside seating. During the day, a place can be found inside to get the full 9 yards worth of fun. So on our last trip earlier this year we made our usual trek through Downtown Disney which usually concludes with a visit to Trader Sam's. There were seats empty at the bar when we got there early so Mrs DLT ordered a virgin something or other. I ordered something a little stronger but came in a souvenir mug so I could add to my collection. We did our consumption and were getting ready to leave but my left foot had fallen asleep while resting on the bar railing. I wiggled it a few times and thought it was waking up. The rest of this story is true but with God as my witness., this what happened. As I stood up, and as what usually happens within Disney properties, some guy jumped into my now vacant bar stool. I stood for a moment and thought my foot was sufficiently awake enough to begin the walk out of Trader Sam's. I thought wrong. That first step was like stepping into the abyss and there was nothing beneath me. I crashed and tumbled into the table in the above picture only now there were people sitting at the table as the tiki bar began to fill. I excused myself and somehow managed to pull myself up with no damage caused to the people sitting at the table only embarrassment to my pride. I apologized and said my foot had fallen asleep. Whether they believed me or not, I don't know. I hobbled out of Trader Sam's only to be greeted by some Disneyland Hotel manager who asked if I was alright or needed to see a nurse. Embarrassed as I was, I just said I was fine and twisted my ankle a little bit but would be OK. We made our back through Downtown Disney with me having to stop every so often to give my sore foot a break. That night, two kindly ladies offered Mrs DLT and myself a spot on their bench to see the Electrical Parade. Mrs. DLT went on to tell them the whole story of my fall. Turns out they were nurses who said I should be seen by a doctor as soon as possible. I wasn't about to go see a strange doctor 500 miles from home so kept reassuring Mrs DLT that is was only sprain and I'd be able to stick it out the next 3 days we were scheduled to be there. She reluctantly accepted but still thought I needed to be seen by a doctor. When we got back to the hotel room my foot looked like below and only got worse. But Disney trooper as I am, stuck it put and hobbled through the next 3 days painfully and with frequent breaks toy sit down and rest my foot. When I got back home, I did go to see my regular doctor who immediately sent my for an X-ray and came back that not only was the foot sprained but also had a fracture. So for the next 6 weeks at home or at work, I was saddled with a large walking boot that is still sitting here in the living room for some reason. Maybe it's waiting for my next trip in a couple of weeks. Maybe I should take it with me. 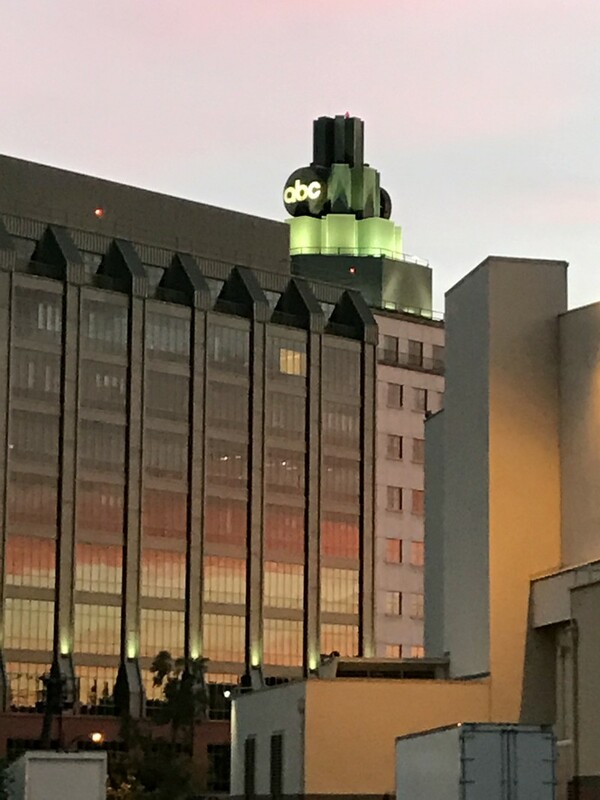 I asked the orthopedic doctor who examined my foot if walking around Disneyland for 3 days after the fall had caused additional damage to the foot. He said 'No' the damage came with the fall and the way to move forward was to treat it and immobilize it. Mrs. DLT still says I should have seen a doctor when it happened but just meant we probably would have to come home and miss out on the trip we had planned. Wasn't going to do it. You know what they are. The usual suspects. 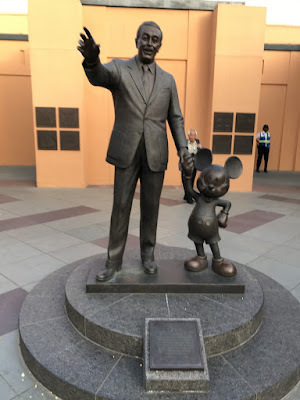 The big rides of Disneyland and Disney California Adventure - rides that have one hour, two hour, sometimes longer to get on with stand-by waiting; The question is now that I am in my 6th decade on earth, would I still ride them. When I go to Disneyland with Mrs. DisneylandTraveler, I generally avoid them because generally she can;t go them. She has inner ear and balance issues which prohibit her from anything with speed or radical motion. But what about me? I'm about 4 years older than Mrs, DLT but as Indiana Jones once said "It's not the years, it's the mileage:" Let's a identify what I call the Big Rides. Over in Disney California Adventure, there is Soarin', Guardians of the Galaxy. California Screamin' Grizzly River Run, Goofy's Sky School, and Radiator Springs Racers. In Disneyland, I would avoid the Matterhorn. It used to be on of my favorites but now with the new cars and confined seating arrangement, the old girl is just not what she used to be. The rest are still OK with me even with the advancing years. Over is DCA, the one big ride I would avoid is Goofy's Sky School (the old Muhulland Madness) ride. Those are cramped quarters in those cars and if you got any leg length at all, it's nor fun. If you are afraid of big rides, don't be. In order to cram people through. most of the big rides are fairly short in length and Disney loads millions of people on these rides every year safely. If you are not a fan of Big Rides, play it safe and stick with Pirates of the Caribbean, Haunted Mansion, Buzz Lightyear, Jungle Cruise, Small World and Toy Story Mainia. These are the less heart pounding forms of entertainment. So before our December 2016 trip, Mrs. DisneylandTraveler was reading up on D23 and their annual opening of the Walt Disney Studios for D23 members. Now I haven't been the biggest fan of D23 because it is too Southern California centric and the rest of the country doesn't have the opportunity to take advantage of what D23 has to offer. But she decided we needed to be members anyway because one of the perks was being able to members being able to attend what amounted to be a D23 open house. 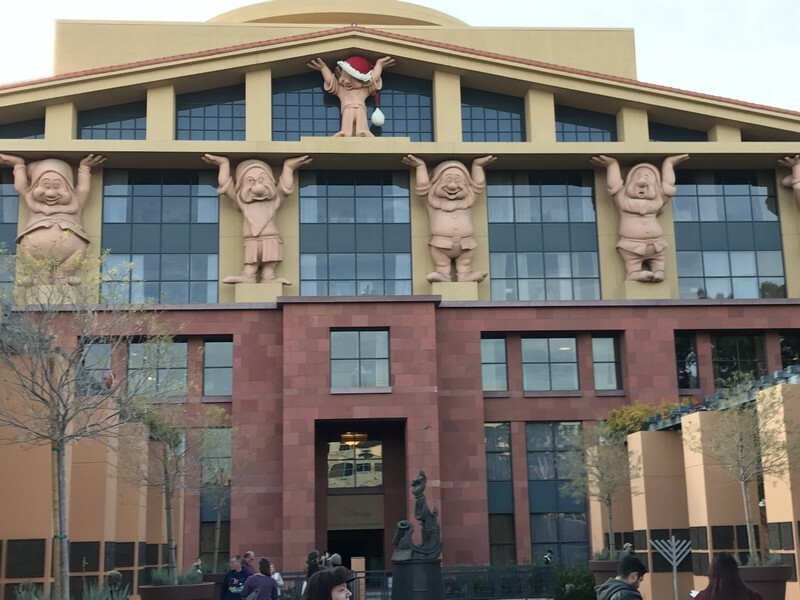 On our way to Disneyland we stooped in Bubank at the Walt Disney Studios for the D23 gathering and Christmas celebration. We parked in the Disney parking structure, walked over to studios and tried to get our acclimated with all the buildings and structures. 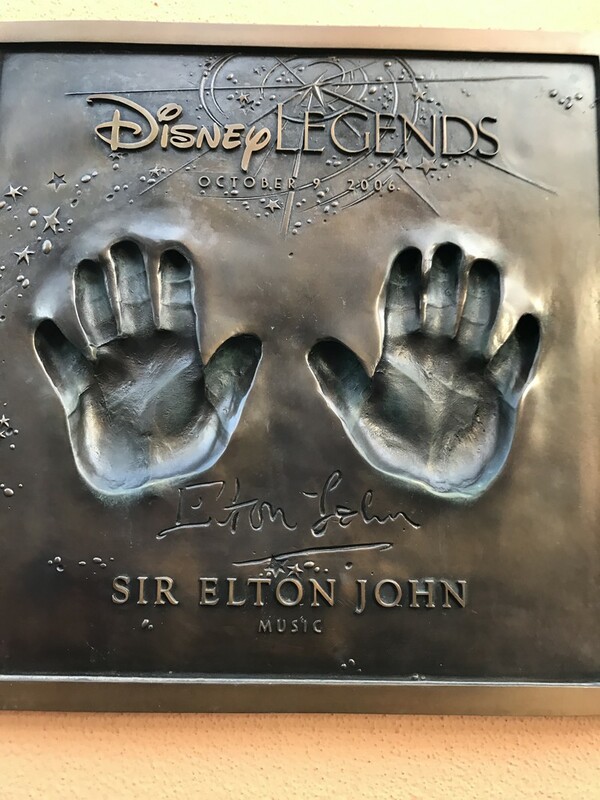 Except for some Disney touches here and there it looked like any other large office complex, What was impressive was the walkway of Disney legends hand prints adorning the pillars outside main Studios building. Some were cool like George Lucas, others poignant like Robin Williams, but it was an interesting thing to see. Outside of the Legends section just in front of the main building with 7 dwarfs statues seemingly propping up the roof, the rest of the place was pretty non-descriptive.. Big buildings, smaller buildings, and a log of open space. There was an area were the TV/Movie actors trailers are parked but hardly a big deal. I did get amused when a man with his briefcase used a security badge to get into one of the larger buildings. 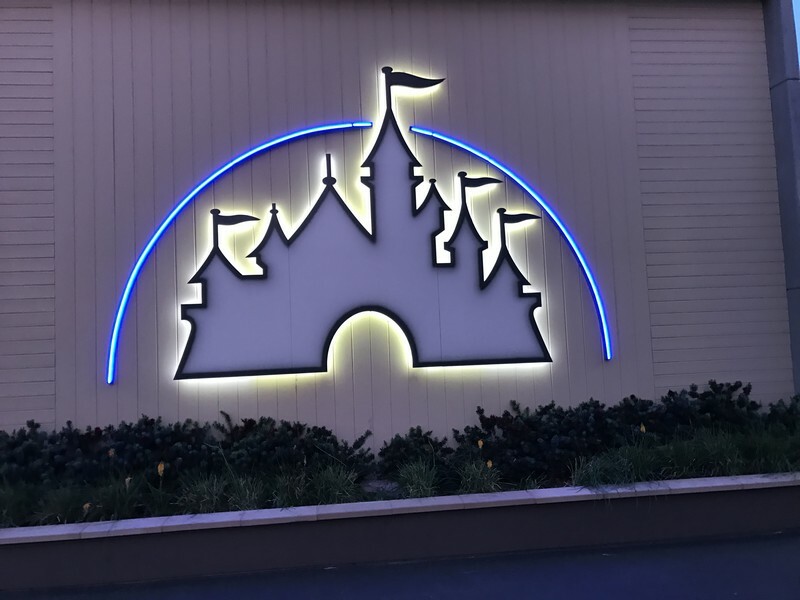 Imagine that, an actual working employee of the Walt Disney Company not connected with a theme park. Just looked like a guy going to work. Mrs. DLT wanted to go to the Employees Only Company store but its small and only a few people were allowed in at a time. By the time we made it over there, the line was a couple of hundred people deep so we blew that idea off. Out of the 4 hours of the D23 studios open house, we ended up staying about 2 hours then continued our way down to Disneyland. Was it worth the trip? I'd say yes because you are able to see things that are normally reserved for employees . only. This is behind the scenes type stuff so for that I feel a little privileged, Would I go again? Probably not. I've seen it once and that was enough. The big D23 Expo is this weekend at the Anaheim Convention Center. It's not free by any means but your D23 card gets you a bit of a discount.. But you have to admit, they put out a beautiful quarterly magazine. ABC Television Studios Just Across the Steet from th Disney Stdios. Believe it or not, the picture above was taken of people waiting in the security line just to get into one of the parks. The security lines are often longer and take more time than the turnstile lines. It's sad, but security has become a big thing at Disney properties, it's also needed in these times of world uncertainty. 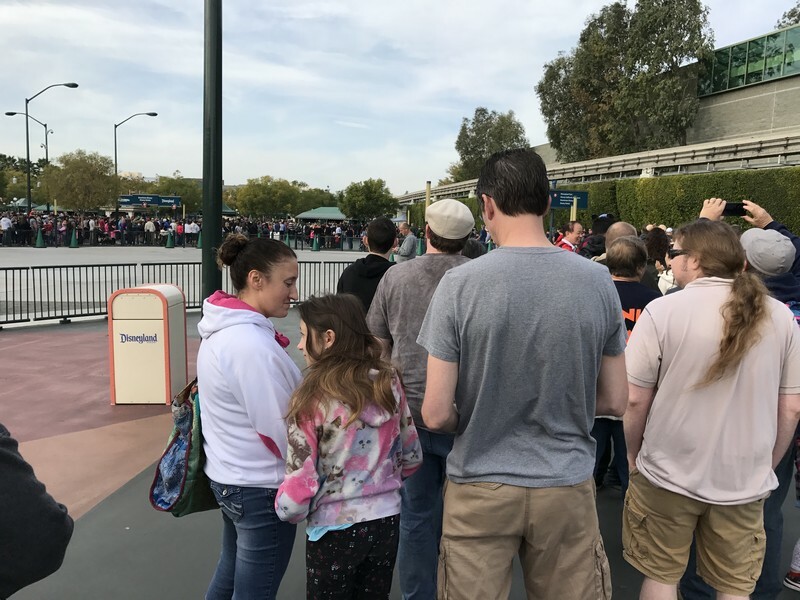 But as bad as the lines are outside the parks, inside parks can be equally as challenging and frustrating as you are now greeted with swarms of people, half of them with strollers and another quarter of them with some kind electric vehicle. It has become an obstacle course of dodging, passing, and trying to keep from being hit by someone or something. Few things as are as irrating as a stroller being rammed into your Achilles tendon. Most people are nice about it, apologize and everyone moves on. Sometime you get that person who thinks its your fault for walking too slow. Concentrate on all the good people in the park and ignore the bad. Easier said than done. 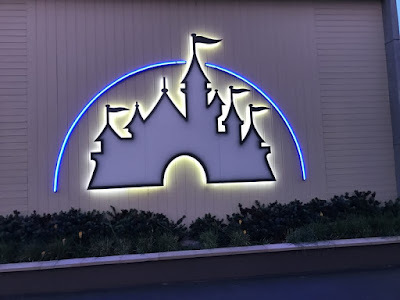 Mrs. DisneylandTraveler and I have tried to make our trips during the "slow" seasons maybe late September, the week before Thanksgiving, the first 2 weeks of December, spring time away from spring break. None of that works anymore as the Disneyland parks are crowded all the time no matter what time of year. The only time the crowds seems to drop is when it rains which is infrequent in Southern California. Anyway, I'm giving summer a shot. Don't know what to expect as far as heat or crown levels but they great thing about July is all the Southern California Annual Passholders are blocked out so what''s left are the true vacationers and people with the more expensive Annual Passes (mine costs an arm and a leg and then some). Hope it works out for the best. That's all you can do. I see it's been more than year since I last posted to this blog and yet people still read it - usually a couple of thousand a month, I guess it served purpose. There is a reason for my absence that I may get into later, but as for now, I've got some catching up to do. Since I last wrote an entry in this blog, I have made 3 trips to Disneyland and a fourth coming up in two weeks. Each trip has it's own identity. Sometimes thing work out as you planned, sometimes they don't. But each on is a unique experience and you always come with something to remember. So besides our trips to to Disneyland there has been, park construction, movies and TV, and people in the news that need to be talked about so sit back. relax, and let's see if can get this puppy moving again. All comments and suggestions are welcomed. I don't bite. 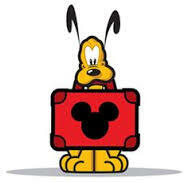 The Disneyland Traveler Blog is not in any way, shape, or form affiliated with the Disneyland Resort or the Walt Disney Company. Views and opinions expressed are strictly my own.